Summary Pogoplug Cloud provides access Pogoplug services without a hardware appliance. • Lack of documentation in general means beta is really meant for people with previous Pogoplug knowledge. • Pogoplug Browser software still mediocre. One of the big questions I always had while reviewing a Pogoplug was: "Why do I need this device? All the magic here is in the software. Can't Cloud Engines just do this for me?" Apparently, I was not the only one. Cloud Engines' announcement of Pogoplug Cloud Beta last week was basically a "Duh, finally!" The major limiting issue with all of the previous hardware 'Plugs was the end-user's Internet connection. Let's face it: Broadband here in America is slooooow compared to the rest of the world. I was excited in my previous apartment to be able to have a 25 Mbps symmetric connection to the web, which is the entry level connection in places like Korea and Japan. But that's the minority compared to the rest of America, which is lucky to have 6 Mbps down and 1 Mbps up. Without going on my soapbox on why America is so behind (not entirely our fault), it's a problem that Cloud Engines' was going to have to face sooner or later. Pogoplug Cloud was the obvious solution, and so without further ado, lets dive into the features. If you've read any of my previous reviews, you're not going to learn anything new. Pogoplug Cloud really offers nothing new in the way of features from my last review of Pogoplug Mobile. There will be few who argue that there are, in fact, fewer features because you lose the "infinite" expansion of the hardware devices. However, I would make the argument that being able to stream video without problems is a worthwhile tradeoff. Looking at the accounts, something new in a Pogoplug review, Cloud Engines has taken a model very familiar with the rest of the industry. Right now, there's only a free account that provides 5 GB of storage. Under the "Coming Soon" banner, there will be a 50 GB and a 100 GB plan, for $9.95/mo and $19.95/mo, respectively. Until the product is out of beta however, 5 GB is all that's available. So, since there are no new features to speak of, other than a hopeful speed increase, let's see how we interact with Pogoplug Cloud, since we don't have a hardware device in the mix this time. Setup was a standard online account setup affair. Provide an email address and a password and you're good to go. You'll be presented with the standard Pogoplug web interface, which will now have a "device" entitled "Pogoplug Cloud". Note that if you already have a Pogoplug hardware device, the web interface mixes the Cloud-hosted files in with the device-hosted files on every tab except the "Files" tab. The mobile applications do the same, so at least it's consistent, but still confusing. As soon as you land on the home screen, the web interface begins downloading the Pogoplug Browser software, which I covered in my Pogoplug Mobile review. I groaned at seeing this as the method to upload files, mostly because it was fairly buggy the last time around. To my relief, the Browser seems to have gotten better in the month since I last looked at it. But it still has syncing issues that I've never been able to figure out the cause of. I had the Browser upload my normal testing suite of MP3s, JPGs, PNGs, and movie files. This time, since I was on my Windows machine, I uploaded a WMV file as well as an MP4 and MOV file, just to see how it was handled on the mobile devices. This all uploaded smoothly, and showed up in the web interface. I had some trouble with the web interface not correctly refreshing its contents when moving between tabs. If you run into this problem, pressing the browser "Reload" button a couple of times resolved the issue. The initial signup screen on the web. First login from the web interface after signup. The available downloads for Pogoplug Browser. Signing in on the Pogoplug Browser software on Windows. Wizard process on the Pogoplug Browser. Importing looks much the same as it did in the Pogoplug Mobile review. Occasionally the web interface didn't reload itself correctly. Selecting all movies showed the correct things, but required reloading the Timeline view. After reloading, everything worked fine. So the web interface works, but how about mobile devices? Well, that's pretty much the same as Pogoplug Mobile, except it is significantly faster, which is the major bonus here. On iOS, the WMV file refused to play on the latest version of the Pogoplug app, and in fact crashed the app when I accidentally tried to load it a second time. However, downloading the file and passing it off to Azul Media player (great app by the way) worked very well. On Android, you have to pass off the file for playback anyway, so the movie player I have installed on my Asus Transformer worked fine. An interesting note with videos is that it appears that the videos do not get "optimized" AKA re-encoded on the server, but rather on the client and then uploaded to the server. I'm sure this is to save on CPU power on the server side, but the Pogoplug Browser software didn't seem to optimize either the MP4 or the WMV file. Streaming MP3s worked well, as it always has. Photo browsing and other files worked fine, too. So overall, the experience was fairly good once everything was in the cloud. Security is unfortunately not documented at this point. One could argue it's because the product just launched and it's still "In Beta". But unfortunately Google has completely changed the concept of a beta due to how long their products remain in "beta"—sometimes for years as was the case with Gmail. Cloud Engines is not Google, however, and needs to rectify this lack of documentation quickly. 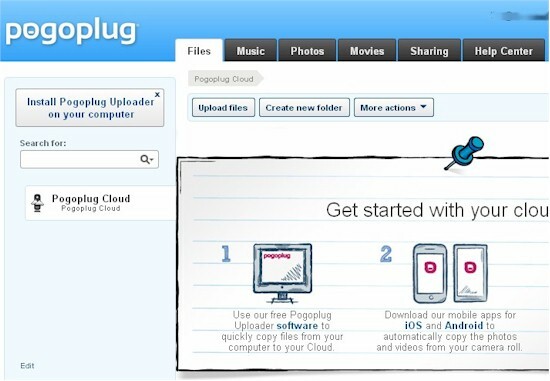 Overall, Pogoplug Cloud is a good addition to the Pogoplug family, which, with the release of Cloud, has been revamped. The new website points you firmly at the Cloud product, with links to the classic hardware products not very obvious. From the main site page, you can find them under the Expansion link. Or via an actual Devices link on the Features page. The Pogoplug Biz has been discontinued. So the only device options are now Pogoplug Classic for $49.95 (plus shipping) and Pogoplug Mobile for $79.95 (plus shipping). Either of these options makes the $5 or $10 a month for Cloud seem expensive in the long run. If you would rather supply your own hardware, there is also the Pogoplug Remote Access Software for $29, one-time. So is Pogoplug Cloud a good deal? Compared against Dropbox, Pogoplug Cloud comes out ahead as far as features are concerned, but only barely. Both services are basically dumping points in the cloud, from which you can share with friends and family via different methods (email, Facebook, Twitter, IM, etc.). Pogoplug Cloud does a better job with regard to sharing. But Dropbox's ability to share with other Dropbox users nearly outweighs this, as it enables a level of collaboration that Pogoplug Cloud currently does not support. You could do something like this with the now-discontinued Pogoplug Biz, but it wasn't pretty to set up or use. Pogoplug Cloud compares similarly against other services like SugarSync and Box, although Box has much better business features than Pogoplug Cloud. But that's not really Pogoplug's market. It's also important to note that the service is still in open beta, so some of this could change. Sharing with other Pogoplug Cloud users is merely a software problem now, as it was already doable with the Pogoplug Biz. Whether or not we'll see a business side of Pogoplug Cloud is yet to be seen. The bottom line is if you're using an existing cloud storage service, there's not a major reason to change just yet, unless your current provider is missing a decent mobile application.